The Voyage North carries a sense of cultural exploration as you travel to the major coastal cities and remote communities, continuing up into the Arctic Circle. Explore the rugged coastline as you go face-to-face with natural and thrilling excursions. On the whole trip you can enjoy some of the freshest Scandinavian food to be found. Enjoy the atmosphere and culture in cities like Bergen, Ålesund and Tromsø – all filled with coastal history. We sail from Bergen to Kirkenes on this seven day trip, where you will see one landscape more dramatic than the other. This adventure will give you spectacular experiences you will never forget. The Hurtigruten sets sail from Bergen harbour in the evening, heading for the Arctic. As we sail along the coast, a wealth of experiences await – the Jugend town of Ålesund and a summer detour into one of the world’s most beautiful fjords, Geirangerfjord. We continue north to the medieval town of Trondheim, where the Nidaros Cathedral is a hightlight for many. Experience the exitement as we cross the Polar Circle and visit Tromsø, before we continue even further north and arrive Kirkenes. This city is right on the Russian border. Vi are acctually as far east as St. Petersburg. Winter is perhaps the most special time to explore the wild and untamed Norwegian scenery. The landscape is a magical winter wonderland covered in white snow, and perfect for action filled winter excursions like dog sledging, whale watching or snow mobiling. On deck the air is fresh and crisp. Clusters of cosy houses glow on the shores like embers. The stunning backdrop of snow-clad mountains reflect the polar twilight. Hopefully you will experiene the mesmerising Northern Lights. During spring time, the contrast between southern and northern Norway is huge. From Bergen to Trondheim you will sail through a lush and green landscape in blossom in close to summer temperatures. Further north in the Arctic region, winter struggles to maintain its grip. 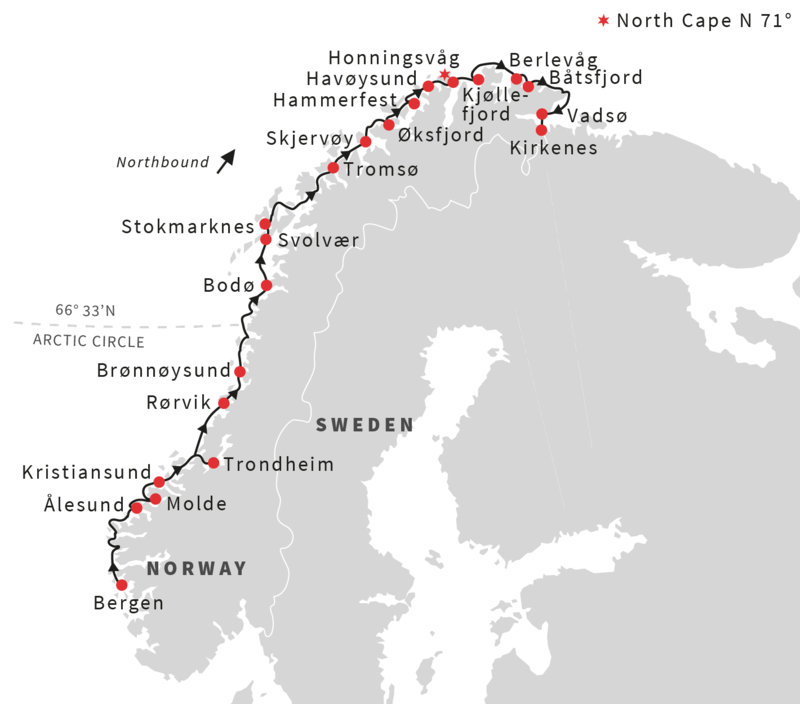 As you cross the Arctic Circle sailing towards the North Cape and Finnmark – it is usually full winter, and from mid May the midnight sun offers 24 hours of daylight, even if the temperature and weather is more like winter. It is just like experiencing three seasons in one journey. Summer is the most popular time of year for exploring Norway’s coast. The long, light days during the summer months seem to energise both nature and people. Even as far south as Bergen, you can experience 19 hours of daylight. Flowers bloom, rivers fill with fish and giant waterfalls cascade towards the ocean, creating a picture-perfect setting for a summer holiday. As summer fades, the first cool evenings summon the colours of autumn. The fresh and clear coastal air enhances the intense red and yellow that fills mountainsides, hilltops and woods. From the deck, you may see the sharp profiles of the highest peaks sprinkled with the first snow, against the background of an ice blue sky. Gradually, the evenings get darker and the days shorter. With a bit of luck, the Northern Lights will appear and give you a magic experience. No matter which season you choose, a trip with Hurtigruten from south no north will create memories for life, and you will most definitely long back for this adventure. Arrival Bergen by plane. Transfer to city center. Your 7-day expedition to the high north starts in Bergen, a city surrounded by seven mountains. If time before departure you may wish to explore this cultural gateway to the fjords. Bergen was founded in 1070 AD, and was the capital of Norway for several years. The city is a central point for Norwegian travel, and has retained a great deal of local character and history. One example of this is the historic UNESCO-listed Bryggen district with colourful wharfs that date back to the 14th century. Take a stroll around this charming and compact city, spend some time in one of the outdoor cafés and restaurants, enjoy a trip on the Fløibanen Funicular or visit the famous fish market. The Russian border is a just few miles away. You may find it intriguing that the local road signs are written in both Norwegian and Russian. We will go on a king crab safari where we catch and eat giant king crab from the Barents Sea. Transfer to airport and flight to Oslo. Transfer to airport hotel. Return to China, or add more days in Norway?